‘Jogging’ has been defined as ‘sub-maximal’ running, typically at speeds between 6-10mph (10-16km/h). 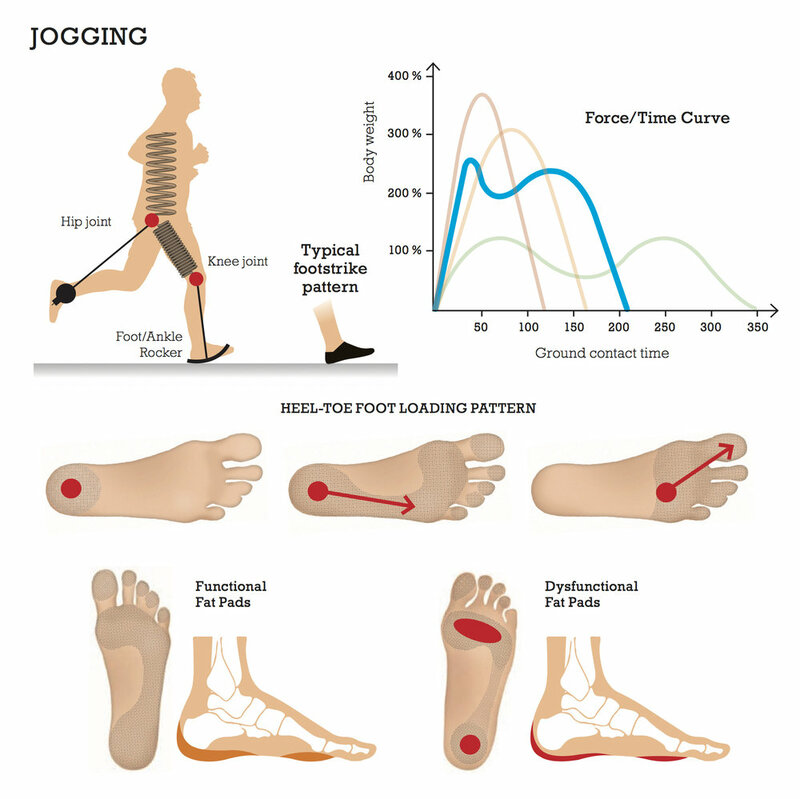 Biomechanically, jogging is a ‘hybrid’ gait with characteristics of walking and running. Using one or both of these definitions of jogging means 80-95% of recreational ‘runners’ are actually ‘Joggers’. When jogging, the knee and hip act like ‘springs’ as in running, but the foot and ankle act as ‘rockers’ with the same heel-toe pattern as walking. Jogging places the ankle and foot rockers under considerable load compared to walking. The forces acting on the leg during the support phase double from 120% bodyweight when walking to over 250% bodyweight when jogging. The range of movement required at the ankle also increases from a minimum of 10 degrees dorsiflexion when walking to a minimum 20 degrees dorsiflexion when jogging. Both of these facts play a role in the high injury rates experienced by joggers. Any injuries or pains associated with the biomechanical compensations used during walking (e.g. toeing out, over pronation, heel pain etc.) will be exaggerated and aggravated when jogging. The knee joint is particularly vulnerable to overloading and injury during jogging when toe structure and function is compromised and jogging technique is poor. Toe function is essential for injury-free jogging as they ‘anchor’ the foot and determine the trajectory of the knee joint over the foot during the support phase. The action of the toe flexors and extensors also play an important role in assisting the shin muscles in decelerating the foot and tibia during the entire ground contact phase. Weakness in the toe muscles is associated with anterior and posterior ‘shin splints’. An anatomical toe box (wide, flat and foot-shaped) is essential to allow the toes to provide maximum stability and leverage and allow the toe flexors and extensors to assist the anterior and posterior shin muscles. The biomechanics of human locomotion can be explained by the physics of pendulums and springs. Humans have essentially four locomotive strategies available: walking, jogging, running, sprinting. These locomotive strategies become progressively less pendulum like and more spring like as speed and gravitational loading increase and contact time decreases (see diagram). Each locomotive strategy has energetic and biomechanical consequences i.e. metabolic cost and risk of injury. Skillful human movement is characterised by adopting the locomotive strategy for a given speed and terrain that maximises economy while minimising injury risk. Movement strategy selection is influenced by several factors including habit, conditioning and accurate sensory feedback about the external environment.